This entry was posted on Sunday, August 19th, 2018 at 8:31 am and is filed under computer science, mathematics, networks. You can follow any responses to this entry through the RSS 2.0 feed. You can leave a response, or trackback from your own site. Jade Master: Sounds like a superhero, or some science-fiction character. The full name Jade Edenstar Master is even cooler. Which scientists have the best names? The astronomer Alan Heavens is certainly high up on the list. “Jade Master” sounds like someone out of a Chinese martial arts movie. Jade is indeed a cool guy, but I’ve never seen him break a brick with his bare hands. I think the best scientists make their own names sound cool… just by being cool. Names like “Pythagoras”, “Einstein” and “Gödel” have become iconic. Gödel and Einstein are rare names. So are Beethoven and Mozart. Bach is relatively common, and Schubert even more so. Tegmark is very, very rare. Newton is relatively common, Darwin relatively rare. There might be only one Lavoisier. So, there are famous musicians and scientists with both common and uncommon last names. (Of course, there is a musician and a scientist with the same relatively uncommon last name. :-) ) Nevertheless, among scientists or musicians, is the fraction with uncommon last names higher than in the general population? Among those with uncommon last names, are there more scientists and musicians than in the general population? Faraday, Schrödinger, Heisenberg, Born, Jordan, Planck, Feynman, Witten—all relatively uncommon. Or maybe having an uncommon last name may turn you into a scientist/math person, because you are already labeled as ‘non-normal’. I wonder if this holds for first names too, and what happens if both your first and last names are uncommmon—perhaps a double dis/ability. . The unusual name might help as well, since people will know that it is your work. Max Tegmark famously adopted his mother’s maiden name (which is rare, even in Sweden; there are just a handful of people with this name, all closely related to Max) when he arrived in California. He had previously been Max Shapiro (son of mathematician Harold Shapiro), which is a very rare name in Sweden, but not that uncommon in the USA. There is more than one Shapiro in astrophysics. Of course, “common” refers to the country/language in question. Bach is not as common as, say, Schmidt or Schneider, but is relatively common, maybe as common as Meyers (in various spellings) in the USA, say. I’ve never heard of anyone else named Beethoven or Mozart. Interestingly, Johann Sebastian Bach was not that famous in his own time. The most famous composer in Germany at the time, and friend of JSB, was Georg Philipp Telemann (Godfather of Carl Philipp Emanuel Bach), who also sports a really rare name. Most people would probably put Bach at the top of the list of Baroque composers (or, maybe, even of all composers), with Händel an Vivaldi close behind. These are to some extent the “big three”. Then, there are the rest: Telemann, Boyce, Scarlatti (more than one), Corelli, Soler, Schütz (Baroque, but a previous generation), Lully, Rameu, Albinoni, Couperin, Pachelbel, Graupner, etc. Personally, I would put Telemann between Bach and Vivaldi, probably closer to Bach. For some reason, Telemann is not that well known nor are his works performed that often, but he is worth checking out. He also wrote a huge amount of music, much of it lost—about 6000 works altogether. Mozart was also prolific, but died young; Telemann lived to be 86. Definitely worth checking out. Perhaps his huge output influenced his reputation, because many couldn’t believe that one could combine quality with quantity. Although he did write a large number of works, they are not just variations on a theme (like, say, Scarlatti’s harpsichord stuff), but very diverse, probably more diverse than that of other composers of the time. Bach achieved a bit of local fame when he became cantor in Leipzig. Interestingly, the first person on the short list was Telemann, who declined after negotiating a higher salary in Hamburg (where he spent most of his life, also dying there). After number 2 (Graupner) also declined, Bach got the job. Telemann knew both Bach and Händel, but the latter two didn’t know each other. Some say one had never heard the music of the other, so similarities are down mostly to common influences (particularly somewhat earlier Italian music; Händel had spent some time in Italy, and Bach was a fan of Vivaldi). They were otherwise quite different: Bach had two wives and 20 children; Händel was probably gay (though, of course, at the time, not openly so) and had no children; Bach worked mostly in what even today is still rather out of the way, Händel worked in the biggest city in the world and was a friend of the king; Bach wrote in every genre of the time except opera; at least early on, Händel was famous mainly for his operas; Bach struggled with debt; Händel was rich. Old joke: What did Mozart do after he died? He decomposed. I have a suburb of Paris, a town in Russia and one in Texas, and a gold mine in California (near where all those fires in Redding /Mt Shasta were) named after me–or at least have same name . Godel always i found a fascinating name because its similar to god, and ‘waiting for godot’ (famous play). I have a degree in chemistry and from wikipedia i see that Petri nets were invented to formalize chemical reactions though they were not discussed in my classes . (i actually did very little lab chemistry –i basically studied quantum and physcial chemistry (statistical mechanics) at a low level–i was into theoretical biology (Turing patterns—reaction-diffusion equations, ecological networks) but they didnt have a degree program in that so i called it chemistry–it could be alchemy. I’m trying to decide if category theory and all these other formalisms (bond graphs, etc) can be useful for my own ‘projects’—-these are actually social and economic issues– . how do you combine people and tasks into teams or working groups which are functional (not disfunctional). In economics I think this is called a ‘matching problem’, and there are similar problems for things like marriages and where to go to college and what to study. In statistical physics and stochastic processes i think trying to calculate ‘reachability’ is called calculating a ‘stopping time’. I think I can see the usefulness of this formalism but its at the ‘rocket science’ level while more people i know including me arent at a level much above figuring out how to tie their shoes. Since i have done alot of hiking (spent more time on that than math though i always carry some math papers with me) i am always trying to calculate probabilities for the ‘shortest path’ to the ‘highest mountain’ or nice place (usually a ravine where you find the interesting flora and fauna) . Sometimes you end up in a box canyon, other times you find a fairly easy route. I’ve wondered about this too. Could it be that having an unusual name helps you get remembered which helps you become famous? One would need to do some studies. I hadn’t known Bach was a relatively common name. It may be in Germany, but not in the United States… so when I hear the name “Bach” I instantly think of the Bach, the master of counterpoint… C. P. E. Bach. 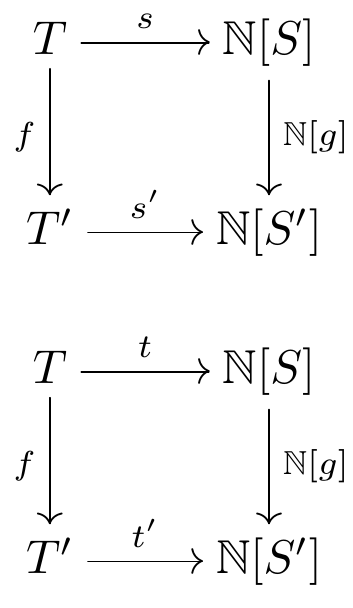 I see that in the paper you talk about the classical reachability problem for Petri nets (deciding whether one marking is reachable from another marking via a sequence of transitions in the net ), and observe that this is equivalent to the existence of a morphism in the free commutative monoidal category . I’m not an expert on that problem, but do you think this observation could provide any new insights? For example, is there any hope of proving some kind of coherence theorem for the categories that would give a new decision procedure for reachability? I have no idea. The reachability problem is famously subtle, and Section 25.1 of my book Quantum Techniques for Stochastic Mechanics describes the comic history of errors that have been made in trying to study it. So, it’s the last thing in the world I would try to work on, even though it’s fascinating. Fair enough! Thanks for the pointer to the interesting historical discussion. Upon thinking a bit more I’ll venture this: you should be able to use open Petri nets to deliberately design Petri nets for which the reachability problem is easier to solve than for general Petri nets. Our comments on ‘one-way Petri nets’ in the Conclusion point at the sort of thing I mean. My feeling is that certain types of ‘looping’ behavior make the reachability problem hard to solve, and you could deliberately avoid this if you wanted. This would reduce the computational power of Petri nets, but very often when you’re trying to design a simple reliable system you’re willing to sacrifice computational power. A while ago I stumbled across a workshop at the Santa Fe Institute on Turing-incomplete machines for enhanced computer security. (I can’t find it online anymore!) Petri nets are already Turing-incomplete (unless one add extra bells and whistles), but since their computational complexity is somewhere between EXPSPACE and something much worse (and nobody knows where—read the comic history of errors), it may pay to dumb them down a bit further for some purposes. 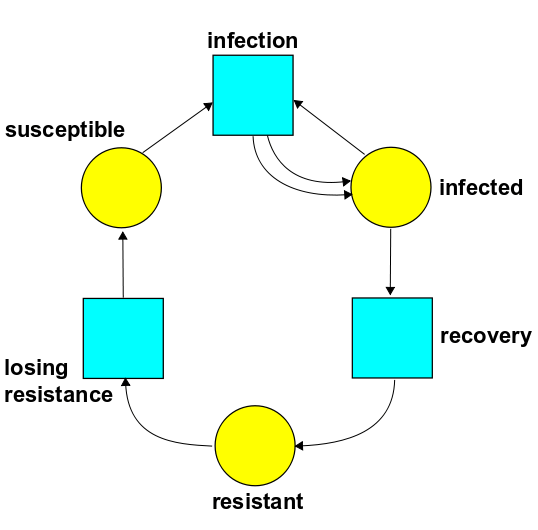 It looks like there is a typo in the first example: I think you mean that there is a morphism [2 susceptible + infected] [susceptible + 2 infected] built using the transition [infection].